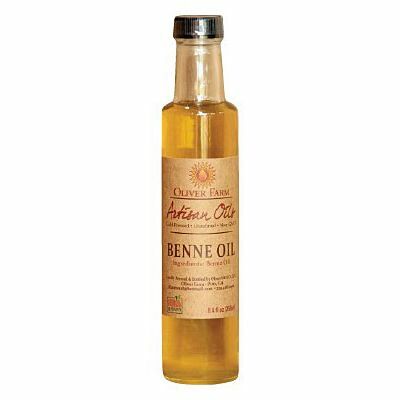 Oliver Farm’s benne oil. Photo: Courtesy of Oliver Farm. Acclaimed Southern chefs including Sean Brock and Underbelly’s Chris Shepherd have been expressing their love of benne oil for years now, and while they’ve used it in their restaurants, it hasn’t been available commercially since the 19th century — until now. That change is thanks to Georgia farmer Clay Oliver, of Oliver Farm, who is commercially producing the iconic Southern oil, which has been described as more flavorful, aromatic, and grassier than sesame oil. (Makes sense: Benne, a seed, is a precursor to modern American sesame, which was bred with an emphasis on yield over flavor.) Curious cooks across the country will be happy to know that Oliver is shipping his eight-ounce bottles, which go for $20 a pop and are available through his website’s store, nationwide. Once the oil of the South, benne was displaced in the late 1800s by much cheaper cottonseed oil. The story of its return to the market actually involves a few major players in Southern food. Oliver first began producing the stuff for Brock’s Husk and Shepherd’s Underbelly, acquiring the seeds from Anson Mills. In July, Anson Mills’ Glenn Roberts and Oliver began work on a “research project” inspired by the (presumably top-quality) first-run oil preferred by the South’s wealthiest planters. This is what is now on the market: an unfiltered oil made without heat or pressure that has a “thin, tahini-like” layer at the top, sort of like a cream line. Roberts thinks it’d be fantastic for poaching quail, but it’s a versatile ingredient. Thomas Jefferson liked to drizzle it over raw salads, while Shepherd has used it in bibimbap. Go crazy — it’s been a while.